To-do lists used to rule my world. I would have lists for this and that and so many lists with so many things to do that life was just one giant conveyer belt constantly pulling me forward into the next moment and the next thing to do. That was until I realized the point of life is to be the most productive and to always be in my go-go-go energy! The point of life is to enjoy the ride. And all those to-do’s was just having me work way too hard. So then I dropped the to-do list for a while, and I swung totally down into the feminine end of the spectrum where there’s just chaos. There’s no order, and there’s no structure. Now, I found my way back into a happy middle where there is masculine structure to get me through the day, but there’s also feminine flow to make sure that I enjoy the ride. 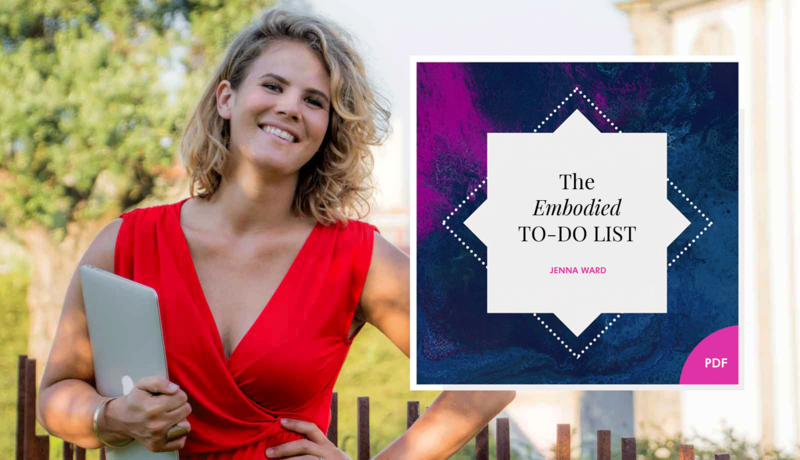 And on a super practical level, that midway point looks like “The Embodied To-Do List”, which is a very sweet, little resource that I want to share with you today. Today, I want to walk you through how to create your own four-part embodied to-do list. My clients, many of my clients, tell me this is a big game changer. I honestly get so much amazing feedback from this useful tool. And so I’m really excited to share it with you today. Okay, so let’s talk about the Embodied To-Do List. I’m going to walk you through the four key parts. But right ahead, you can go ahead and download your own copy of the To-Do list at jennaward.co/list. And you can just print it off straight off the bat. So when we speak about an embodied to-do list, we’re speaking about a masculine structure. A masculine to-do list that allows our feminine essence, our feminine form to be prioritized and valued. and we don’t have any of our feeling, feminine depth anchored in, we create without really enjoying what we create. We do things without really enjoying doing things. And we don’t bring out full feminine gifts to the table. This is the definition of working hard, and this is the society that we live in. But the embodied to-do list is really about getting clear first on your depth. Your feeling, the energy that you’re embodying. And then going and moving forward. And I can tell you, this brings so much magic, so much more power, and a lot of quite inexplicable ease to the day. So grab your journal and write with me as I explore the four key quadrants. To begin, you want to take your page and you’re going to want break it up into four sections, so that you’ve got four equal boxes. I want you to label them one, two, three, and four. So number one is on the top left of your page. Number two on the top right. Number three on the bottom left. And number four on the bottom right. And these one, two, three, four, a general step-wise approach to how we do what we do in the day. So for me, I sit down at the start of each day. I draw this list up, and I brain dump every single thing that I’m thinking or worrying about. Everything that’s going on in my head that needs to be done that might have been carried over from the day before, I dump it onto this list. But I dump it in the right categories. So category one, number one, the first top left of the list is your embodied energy. What energy do I need to feel and do I need to be today? So let’s say for example I’ve got a training call with some women who are studying in our school at the moment. Okay, so I need to get into a space where I feel really clear to teach. Maybe on the other hand I’m going for a really important meeting with my partner over something that we’ve got planned in the future, and I really want the meeting to go well. I’m really nervous. I actually feel a little bit sick about it in my stomach if I’m brutally honest. But I really want to draw in this opportunity. And I want all the magic of all of the universes to help me. Whether it’s a challenging feeling like nervousness or whatever you’re trying to call in. Whatever you want to be or embody on that day, that’s the energy that gets listed down in this very first quadrant. And we’ll come back to the practical use of that quadrant first, but the key thing is getting clear on who you need to be before asking the question. This is moving into phase two. What do I need to do? So phase two, the second part, is creativity. That’s the name of the second quadrant. Creativity. So no matter what arena or no matter what type of career you have, I, without a doubt, trust that there’s something creative, something inspired. Something really important that you need to get done today. … or Sharing authentically on social media. These are the things where it’s like I really need to be in myself, in my body, in my flow, and it’s the most valuable thing that I’m going to create today. Now, you don’t have to be an artist or an embodiment coach to be able to do that. You’re gonna have something that’s really important and that’s really valuable that you need to create in this particular day. Might be an experience, who knows? But that creativity, that is a very special juice. And it needs to come second on your to-do list. Because when we don’t value our creativity and we begin to get lost in the inertia of the small things that we could be or should be doing, then our creativity can be stifled. And I find a lot of women speak to me about not feeling like they have something to say or something to offer or something that’s very useful. And often the case may be is that they’ve just not been in this feminine creativity energy early enough in their day. What are the creative things that you need to get done today? That’s the question for step two. Step three. Now we’re in the bottom left part of the quadrant, is like sh*t that needs to get done. So I call this getting down to business. Here, we’re really listing out all of the practical things that you don’t need to necessarily be deeply inspired to do. You know, these types of really practical things. And honestly, the embodied energy for the day, it’s gonna be like one or two lines. The creative thing that you need for the day, it’s gonna be one or two lines. The list of things to do, it’s gonna be loooong. And all too often, we begin with that long list of the mundane things, so that we can begin to tick them off and feel productive. And we totally bypass the energy and creativity. That’s actually, as the feminine, where we draw so much inspiration. And when we don’t prioritize these ways of operating, when we don’t put them on the top of our to-do list, then they don’t get done in our day. What’s all the shizz that just needs to get done? And personally, for me, I keep that kind of like work/business focus. Number four is all the bits and bobs. Right now, with my man, we’re planning a wedding. There are lots of personal things to do around a wedding. Might be different things for getting the groceries or calling your mother back, whatever. Brain dump and get down all those personal bits and pieces that don’t fit into any other category. These don’t necessarily have to be done last, but it’s just a way to make sure they’re on the page. And then once you’ve got everything down, first thing, first thing in the morning, get your embodied energy sorted. I personally use a daily embodiment practice called Primal Feminine Flow just to get into my body. I want to clear, I’ll use that practice to clear it. And if there’s something that I want to call in and something that I really want to be for that day that I want to magnetize, okay, so then I’ll really dance that desire. If you’re interested in accessing that practice, you’re super welcome to do so. 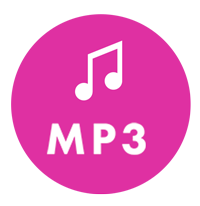 You can download a digital bundle, which includes an audio version of the practice and some guides at jennaward.co/flow. The practice is called Primal Feminine Flow. But you may have your own ritual or your own tool or your own simple way just to drop in and to be in the energy of who do you need to be today. And bringing that woman forth at the start of your day is gonna mean your creativity will be peaked. You’re gonna get through all the mundane things in section three of your to-do list with so much more ease and at the right time of day. Meaning they’re not gonna overtake the really important stuff. And so in this way, what you can really see is that we’re focusing on the feminine first. The way we wanna feel first before we get busy in the getting stuff done. I know for me that using this tool has been so incredibly useful. It helps me to get everything out of my head and into an order that I know is gonna really be nourishing for me. So now it’s your turn. I encourage you, try this way of operating out just for three days. Try it out for three days and see how you go. See if it feels different for you. If you’d like to download the PDF guide that you can exactly see the formula, then just head to jennaward.co/list! And I wanna hear from you in the comment section below. Do you think this might work for you? Do you already do something similar? Or have you tried it out for those three days, and what was your experience? I’d really love to know because I know that so many of my clients like rave about this tool, and I’d love to hear if it works for you as well. This is a really simple, practically little shift for us to be working and to be operating in the world in more embodied ways by putting the feminine on the to-do list. I’m really grateful that you joined me today because the world needs more embodied women. I’m really very honored that you’re here, that we’re connected, and that we’re part of this beautiful growing community together. So thank you. And if you’d like to hear more updates from us, make sure you pop your email address in the sign up box below. And we’ll be in your inbox each week with new episodes just like this one for embodied women. Thank you sooo much for sharing this Jenna! Brilliant!